PM signs agreements with African leaders allowing Israel to deport recalcitrant illegal immigrants, circumvent Supreme Court ruling. 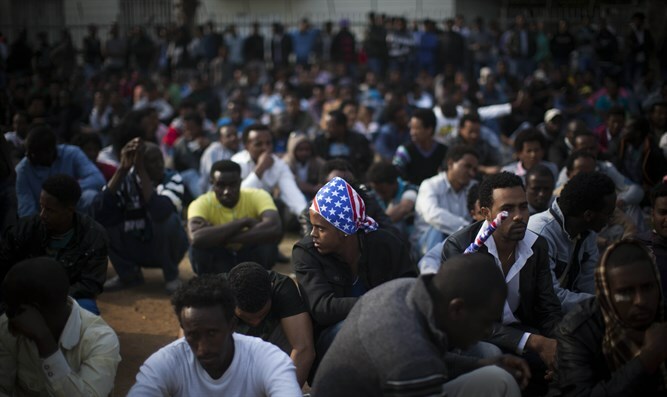 The Israeli government is preparing to deport thousands of illegal immigrants who infiltrated Israel over the past decade, repatriating them to African countries which have agreed to receive the recalcitrant illegal immigrants in exchange for benefits from Israel. In 2014, the Netanyahu government implemented a “carrot and stick” policy to reduce Israel’s illegal immigrant population, estimated at around 50,000. As part of the plan, illegal immigrants – most of whom came from Eritrea, Somalia, and the Sudan – are offered $3,500 cash payments if they agree to voluntarily leave the country. Those who refuse are detained at the Holot center in southern Israel. While some 15,000 illegal immigrants have left Israel since 2014, the government has sought to deport those infiltrators who have refused to voluntarily leave and are currently being held at Holot. The government had planned to deport detainees by force, but was blocked by the Supreme Court in August, when justices ruled that the agreements in place with the African nations receiving the illegal immigrants specifically stipulated that the countries would only accept migrants who leave Israel voluntarily. The court also ruled that detainees held in Holot for their refusal to voluntarily leave the country could be held for no longer than 12 months. Illegal immigrants not held at Holot have concentrated in a handful of neighborhoods in southern Tel Aviv, Eilat, and several other Israeli cities. Residents of the affected areas say crime has skyrocketed over the past decade as illegal immigrant populations have surged. During his September trip to the United Nations, Prime Minister Binyamin Netanyahu met with African leaders to renegotiate the terms of Israel’s agreement with their respective countries to enable the Jewish state to forcibly deport recalcitrant illegal immigrants, Yisrael Hayom reported. Coalition members slammed the court’s decision, noting that the 12-month limitation on detentions at Holot created an incentive for detainees to refuse self-deportation and wait out the detention period, at which point they would be released. With the new agreements, however, the government will be able to circumvent the court’s decision and forcibly deport those who turn down the government’s cash offer.